J Clin Invest. 2006;116(3):553–553. https://doi.org/10.1172/JCI28067. Marc Zimmer. Prometheus Books. Amherst, New York, USA. 2005. 222 pp.222 pp. $28.00 ISBN: 1-59102-253-3 (hardcover). 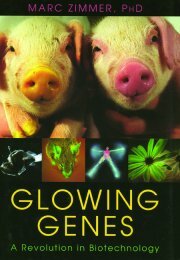 Introducing a popular science book to the masses that covers the depth and breadth of the green fluorescent protein (GFP) revolution is a large undertaking, but one that Marc Zimmer has taken on in his new book, Glowing genes. The lay reader is not likely to have much, if any, prior knowledge of this relatively new field, so Zimmer’s book would seem to be a good place to start making this technology accessible to the masses. At the base level, GFP is exactly what it sounds like: a green fluorescent protein. But why should we care? There are a slew of reasons detailed in this book, and, indeed, the reader could end up being intrigued, but also confused. There are a number of stumbling blocks, beginning auspiciously enough with the inappropriate name of the book — the genes do not do the glowing, it is the proteins (made from the genes) that do so. This could be the result of needing a catchy title for mass marketing, but this degree of imprecision is found throughout the book. The discovery of the original GFP during the last decade or so has provided remarkable new tools to understand biology at the cell, tissue, and animal levels. GFP allows for direct visualization of most any protein that has been genetically fused to it. Scientists now have the unfettered ability to find out where their favorite protein is located in a cell or animal, and this is a tremendous opportunity to further understand how the protein in question functions. Either biochemical, microscopic, or whole-animal approaches can be used to detect GFP, so its market penetration into the lives of scientists is nearly unprecedented. Perhaps even more key to the growing ability to understand protein function is the capability to follow a protein’s real-time movements in the living cell, opening up vast new avenues of investigation defining molecular dynamics. For a book on GFP to be successful, the reader must be walked through difficult concepts and details. While Marc Zimmer has taken pains to do so in certain areas, the overall journey oscillates from too simplistic to decidedly overwhelming. It is concerning to read the sections on transgenic animals and plants, since it treads too close to making such work seem Frankenstein-esque. The choice of artwork on the cover is enough to raise eyebrows, though the author himself dismisses it. The overall style of the writing is sporadic, with frequent leaping segues from topic to topic. Perhaps the intent is for a fun read, but relating stories about a scientist hiring attractive young women for the lab with odd job titles (“Assistant in Fish Problems”) mixed with intense discussions of chaos theory are challenging. Zimmer often presents a cornucopia of factoids, including discussions on the deep sea diving and general underwater exploration that facilitated identification of fluorescent organisms. While interesting, one might be left wondering when the subject will return to GFP. Such sidebars may be useful in that they highlight true-life paths of what led people into science, but they should be metered out carefully. If only flipping through the book in a store, start at Chapter 4, which reports how our modern laboratories far surpass those of 30–40 years ago and covers the intriguing story of Osamu Shimomura, “the grandfather of the GFP revolution.” This is a story of summers spent on docks and boats, plucking jellyfish from the ocean, and hours spent trimming rings of tissue off the edge of each jellyfish’s umbrella. Once the rings of 20–30 jellyfish were accumulated, they were squeezed through nylon gauze, where a faintly luminescent liquid they called squeezate was obtained. Then the scientists tried various techniques to isolate whatever was responsible for this fluorescence, usually failing. Most great scientific stories involve a lot of failure and persistence, and this is one of them. Glowing genes paints a sometimes nostalgic, sometimes perfectly real depiction of the rigors of scientific pursuit and at times wonderfully conveys the level of creativity and persistence scientists employ to satisfy their own curiosity and solve problems for a hopefully greater good. Important details sometimes remain lost; although the subject of transgenics comes up from time to time, Zimmer never provides an adequate description of what this really means. Comparing bacteria to photocopiers might be a cute way to bring the reader along, but the slide into ill-defined terminology like “reporter molecules” and “tracer proteins” made me wonder why a glossary and a few carefully constructed diagrams were not included. In the end, I am left wondering who would really benefit from reading the book. Lay readers are likely to be given enough euphemisms to make them miss or misconstrue the true importance of the work or else hammered with too much detail. Meanwhile, even young scientists-in-training, while having a few good chuckles, will find themselves getting dizzy from eye-rolling responses. Perhaps the best audience is a good-natured, witty scientist needing an occasional smirk on a long flight to a scientific conference.